If you’ve played Sheriff Gaming’s excellent 3D online slot, One Million Ants, or their insect-themed game, Bugs, which is part of the developer’s big-bucks Mega Money Pool portfolio of games, you’ll realize that there are many decent efforts at celebrating the animal kingdom in online slots. Another perfectly acceptable addition to the small-world slots is Rickety Cricket, a Cryptologic slot that has no-nonsense graphics (read: pretty basic) and friendly betting starting at just $0.01 a coin. It comes with 5 reels and 25 paylines. As for symbols on the reels there are 10-through-Ace icons, plus a whole raft of creepy-crawlies including a Snail, Bee, Firefly, Mosquito and Flower. That Flower is Wild and substitutes for all regular symbols in the game other than the Scatter. Where the game falls down slightly is in its jackpots: five Wilds only pays out 750 coins – not too impressive. However, it’s in the Scatters where you will find most of the game’s delights. Three bonus icons appearing on Reels 2, 3 and 4 triggers a free spins round. You will be awarded 8 free spins with a random multiplier from 2x to 6x. While an initial offering of just eight spins doesn’t too clever, bear in mind the spins can be re-triggered up to the value of 98 spins. Meanwhile, the Scattered Bug Zapper icon doesn’t just attract bugs in the night and puts them out of their misery; it also awards Scatter pays when it appears on Reel 1. 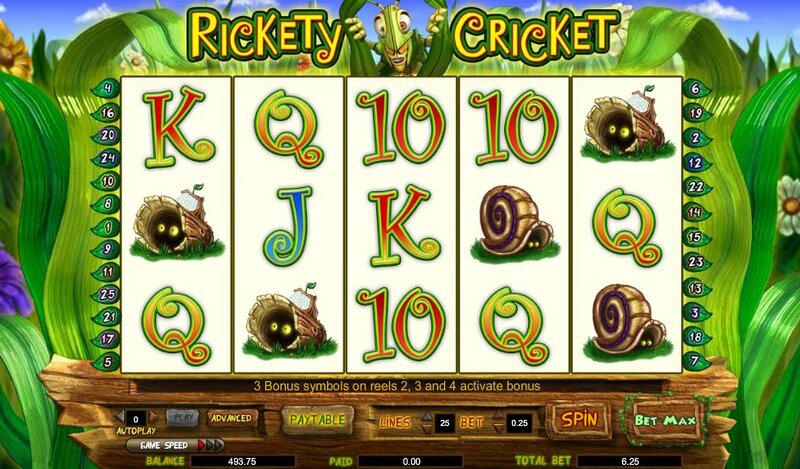 Scattered Queen Bee, Firefly and Mosquito symbols appear on the rest of the reels, and you can earn up to 40x your bet if you hit seven of those critters on Reels 2, 3, 4 and 5. 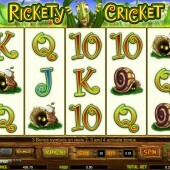 Rickety Cricket can hardly match up to Sheriff’s offerings, but the game does have potential, not least in the free spins you can win. The animation is OK – in a kind of simplistic Cryptologic mold, and hardly world-beating – but the backdrops are nice and green, and the overall theme is quite fun.